This fall, students enrolled in CS50, Harvard’s behemoth introductory Computer Science course, will only be asked to attend two lectures in person. The new policy, one of a host of changes announced by CS50 course instructor David J. Malan ’99 in a recent Medium post, is part of a broad-based effort to streamline the course in its 10th year under Malan’s charge. While students have long had the option of watching the course’s lectures online rather than in person—CS50 is the only course at the College that allows students to enroll in a different course during the same time slot—the latest bevy of changes to Harvard’s flagship computer science course will entirely replace Wednesday lectures with “walkthroughs” of that week’s problem set. On Mondays, meanwhile, Malan and course staff will generally film the coming week’s lectures in sessions that are open to, but not required of, students. 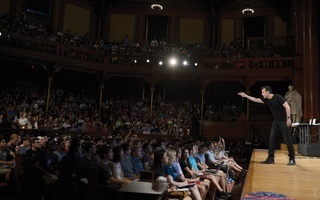 David J. Malan, CS50's course instructor, addresses a class in 2015. Other changes to this year’s iteration of CS50 include “trimmer” problem sets, re-worked office hours and question-answering resources, and even filming in virtual reality. The changes, according to Malan’s post, are a result of course staff going “back to first principles” after explosive growth and modest dips in student evaluations of the course’s problem sets over the past few years. 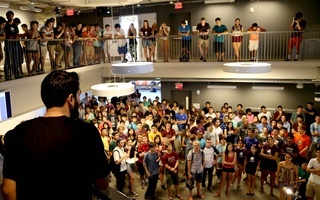 Members of the Class of 2020, many of whom are sure to enroll in CS50, will likely be hopeful that the course's reworked office hours—there will now be far more times a student could potentially seek help from teaching staff—will ease the congestion and competition for assistance from TFs that has characterized CS50’s office hours for the past few years. 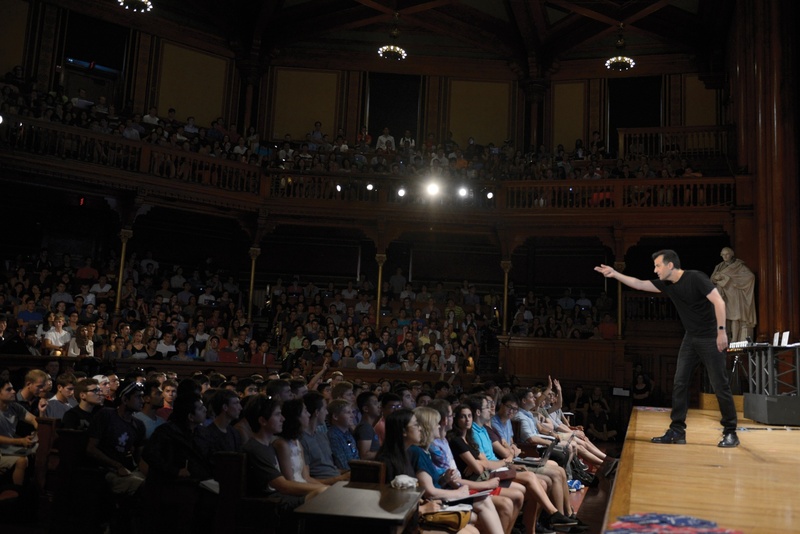 Since taking over CS50, Malan has turned what was once a wonky course of middling popularity into, by many metrics, the most popular class Harvard offers. Last year, for instance, the course had 750 enrolled undergraduates, compared with just 132 in the fall of 2006. Malan’s course is known by and has drawn mild criticism for its carnival atmosphere, complete with a DJ, puppets, and sizzle reels. Despite sizeable operations at Harvard and Yale, where CS50 began satellite operations last year, CS50’s reach has expanded far beyond the purview of undergraduate education. More than 1.1 million people have viewed lectures through the CS50x online course since it launched on Harvard co-founded online education platform edX. More recently, CS50 has expanded into high school computer science education this past year with a pilot program of around 40 schools that drew largely positive reviews. This year, the course held “hackathons” in both London and New York. "While CS50 was once a course... it's now become in our minds more of an umbrella term of any number of educational, technological, and video-oriented experiments and research developments,” said Malan while discussing CS50 research and development in a YouTube video this year. Though apparently popular, these extra-Harvard operations are far from cheap. According to the same video, CS50 employs a staff of roughly 100 undergraduates, graduate students, and full-time professionals. To finance these operations, the course accepts sponsorships from companies, a practice no other Harvard course employs and that is the subject of some criticism among undergraduates and certain professors at peer institutions. One CS50 sponsor, Microsoft, had a sizeable role in developing the curriculum for CS50 AP, though School of Engineering and Applied Sciences Dean Francis J. Doyle III said last semester that “appropriate separation” has been maintained between corporate sponsors and the course’s curriculum. In the same interview, Doyle said that SEAS maintained oversight over sponsorship cash coming into the course. The course was also the subject of an apparent trademark tussle in 2012, when Harvard filed a motion to block Malan’s trademark applications for “CS50” and “THIS IS CS50." Neither Malan nor administrators responded to requests last spring for comment on the filings. Malan and course preceptor Douglas R. Lloyd ’09 did not respond to multiple requests for comment on this story.